Transit has no stronger advocate in the State Legislature than Sen. Marko Liias. Liias serves as Vice Chair of the Senate Transportation Committee, where he has been able to speak up against non-sensical efforts to undermine transit agencies, and advocate for more investment in public transit, with huge success. STB has covered Liias’ career championing transit in Olympia at length. Liias sponsored the Senate bill that would have given Sound Transit authority to take ST3 to the ballot without being tied to road funding , where the transit would have required a public vote and the roads wouldn’t. He then got 19 of his colleagues to sign on. During the fight over reducing car-tab revenue for the voter-approved Sound Transit 3 capital program, Liias proposed various amendments that would have gotten useful gains for Sound Transit to make up for revenue losses, such as permit streamlining for light rail construction. Liias helped shepherd through additional sales tax authority for Thurston County Intercity Transit. Intercity Transit may be going to voters to ask for said increase as early as November. Liias has been able to fend off schemes like having Sound Transit subsidize parking permits for neighbors and making the ST board elected, even when his colleagues wouldn’t raise their voices. In what may now seem like ancient history, Liias was one of the chief advocates for tolling on SR 520. 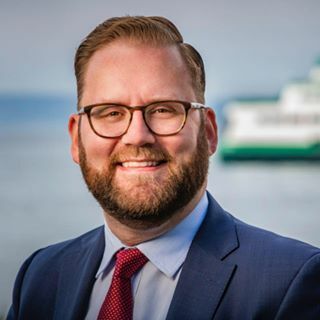 If you live in the 21st District (north Edmonds and Lynnwood, and south Mukilteo), please vote for Marko Liias by August 7. 1) I like Senator Liias, but I don’t think it’s a “scheme” or undermining transit to have the Sound Transit Board elected with more diverse voices heard. Sorry. I will leave it at that. 2) That said, I think Senator Liias is a key pro-transit ally helping cover our backs. We don’t want Sound Transit 3 used as a piggy bank and we don’t want to lose one of the few “transit hawk” State Senators left. We really don’t. Prejudice, maybe, but I think an elected official has to answer to a much smaller percentage of the electorate than an appointed one. In an effort whose chief priority is to unite as many people as possible into a combined effort. So good time to ask you these questions, Joe. One, would Senator Liias be more likely, or less, to be elected to a board than appointed? And two, more important, when in office, how would he govern differently depending on how he got his office? More likely. Should be an easy transition for him and since the City Government of Mukilteo had to let him as a policy analyst go due to budget issues, I’m sure he’d like the 2nd job. Quoting from a BART Boardmember tweet, “I’m the president of the board and I think there are benefits to an elected body. We represent our districts, respond to constituents.” Right now, I think the Community Transit Board is insulated and the Board could do a lot more to be accessible to riders & accountable to the communities Community Transit serves. Heck, I requested – and that request is being honored – for the Washington State Attorney General’s Office to investigate Community Transit for withholding three board committee documents. Something that would NEVER happen with Sound Transit as Sound Transit Board Committees share all documents. Online. One last thing… I would have no problem with the Snohomish County Council appointing volunteers representing riders, charities and concerned citizens to come together and run Community Transit instead. No secret what I really want… more transit riders voices being heard more often – and our concerns acted upon. At least some of the bill versions from Sen. O’Ban that I’ve seen bar members of the ST Board from holding other elected office. Quotes from members of a body saying they think the way their body is chosen is the best way to choose them are pretty much meaningless. That elected officials prefer not to change the way a body they are serving on is elected is essentially Newton’s First Law of Politics, but with a corollary that those in charge like to stay in charge, and would love to vote themselves raises if they could. People don’t like to give up incumbent privilege, and will go out of the way to help draw maps to choose their voters before voters who don’t like them can get rid of them. Joe, you’ve seen all the forced gerrymandering that O’Ban inserts in his bills, to try to get a ST Board majority opposed to completing Sound Transit’s project list and mission. As you know, Sen. Liias has sponsored bills to try to bring more representation proportionality to the Community Transit Board, among other appointed transit boards. If the problem is that the ST Board is not equitably representative, I’m sure Sen. Liias would love to help with that. I want to wrap this thread up today if I can, so I’ll be acute. I mainly spoke up because I didn’t care for the STB Editorial Board’s choice of words to describe the desire of many across the political spectrum to change up transit boards. I’ve seen Senator O’Ban’s ideas. I’m more than a bit wary of this crazzzzzzzzzy idea of county sovereignty that the Washington State Right seems to be pushing – mostly in regards to Sound Transit that somehow counties can veto things. So I think it would be best since most of Pierce & Snohomish Counties didn’t get to vote on ST3 that the districts be drawn by population. Volunteer or elected or whathaveyou is fine by me. I would prefer we get to elect elected officials to these boards and maximum diversity for these positions. On that note, I didn’t know about Sen. Liias sponsoring, “bills to try to bring more representation proportionality to the Community Transit Board, among other appointed transit boards”. Another reason why I like the guy and I’ll look for those bills this afternoon or evening. Finally, respectfully feel that having transit advocates who get elected to transit boards saying it’s a good thing means electing transit boards is NOT a scheme but I would say a controversial idea that if enacted would bring change arguably to the point of instability. For instance, would he be willing to use taxpayers’ money to help STB fix its software for an edit to a posted comment? Just a thought. If so I’ll write him in whatever my address. As a resident of the 21st district, I have to weigh my misgivings about granting Mr. Liias another term in the legislature against the qualifications of his primary opponent(s). I simply don’t have enough information about said opponent(s) on the Democratic side at this time to make such a determination. Thus, at this point in time, put me in the undecided category (setting aside the practical issue of chamber control for the moment). I opposed this carve-out proposed by Mr. Liias (as did Snohomish County) and I believe the amendment was either defeated or was withdrawn, but I may be mistaken about that. Although it ultimately became a moot point, I consider this a strike against the state senator. Anecdotally, I can tell you that Mr. Liias' office has a spotty record of responsiveness to this constituent. Fwiw. You get spotty responsiveness from your senator? I’m jealous. While my senator’s office has returned a couple phone calls to set up a meeting, on which he flaked, he has ignored my emails and phone calls for years. He got through the last gerrymandering, so I guess he thinks he is untouchable. Ah, the joys of single-member district representation. Glad the whole Editorial Board is here, because you can tell me two things: Has anybody in politics asked the Seattle Transit Blog for any information, or assistance to them? And if they did- would the Board field the questions themselves, or do a posting asking for volunteers? STB does get questions at our contact email. Various people field the real questions, and we usually ignore the spam (of which we also get a lot). The Editorial Board, for its part, just writes posts, mostly endorsements. Marko Liias is my state senator, and he has my support and vote in August and November. None of his opponents has made a credible case for replacing him, and none appears to be mounting a serious campaign to get elected. As to the issue of an elected Sound Transit board, there are just a handful of regional transit authorities with an elected board. Denver and BART come to mind, and there may be a couple others. Most boards are appointed, often by the governor as is the case with Portland Trimet. The ST board is fine as it is.